We're happy to offer our readers the chance to attend a free DC screening of Gleason, based on the powerful true story of Steve Gleason. 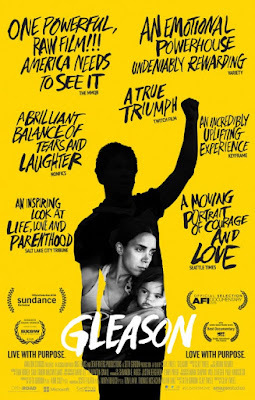 SYNOPSIS: The hit documentary from the 2016 Sundance Film Festival goes inside the life of Steve Gleason, the former New Orleans Saints defensive back who, at the age of 34, was diagnosed with ALS and given a life expectancy of two to five years. Weeks later, Gleason found out his wife, Michel, was expecting their first child. A video journal that began as a gift for his unborn son expands to chronicle Steve’s determination to get his relationships in order, build a foundation to provide other ALS patients with purpose, and adapt to his declining physical condition—utilizing medical technologies that offer the means to live as fully as possible. The screening takes place on Tuesday, August 2nd at 7:30pm at Landmark Bethesda. If you'd like to attend, simply register at the Gofobo ticketing site here and download one Admit-Two pass. Please remember that all screenings are first come first served and you will need to arrive early to ensure receiving a seat. Enjoy the show! Gleason opens in DC on August 5th.